I have collected a lot of recipes from magazines and the internet over the years. It took me awhile to figure out how to organize them. I finally have found that this system works the best for me. I have a 3 ring binder for each magazine or website. I usually can remember where a recipe came from. 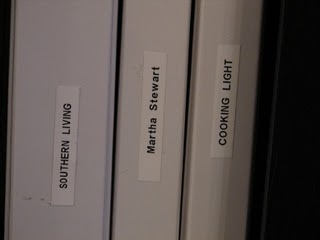 I know I like Martha Stewart’s biscuit. 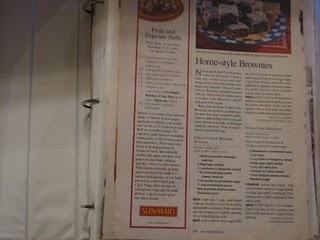 I know I like a recipe from Southern Living for brownies. This way I can just go to the notebook and find it. I use the plastic sleeves that you get in the office supply store or office section of the store. I place the magazine pages in them and then put them in the binders. I also have one for the recipes I have printed off of allrecipes.com. For that one I use dividers for the categories. I have a section for side dishes, main dishes, soups, and desserts. Organizing my recipes like this has helped me so much. It is what works for me. And the plastic page protectors just wipe clean after they get splattered or dripped on! I just have one notebook though. Great tip! I’m in the process of re-typing my recipes. I plan to put them in plastic page protectors as well! What a great idea! I think this would be great for the articles I pull out of magazines that I would like to save as well.